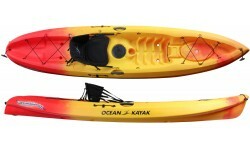 The Ocean Kayak Frenzy is a compact & stable sit-on-top with a strong keel line for good tracking. Great fun for everyone in the family, forgiving in the surf, riding waves or paddling calm waters. 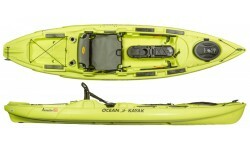 The Ocean Kayak Scrambler 11 is a great all round sit-on-top for general fun on the water. Be it light touring, small surf or a spot of fishing the Scrambler has it covered. An excellent all round tandem sit-on-top for recreational paddling & family fun. 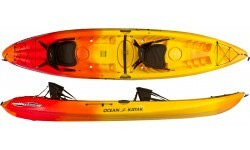 Its design incorporates the perfect blend of stability, comfort & performance on the water. 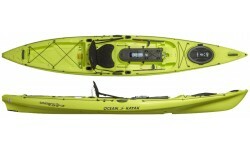 Ocean Kayak Malibu Two XL offers versatility and stability in a proven hull shape. 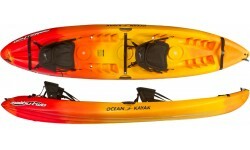 Three moulded in seat wells make it easy for solo or tandem paddling. Completely updated this latest release of the Trident 11 is the smallest in the new Trident line up of specialist fishing craft. 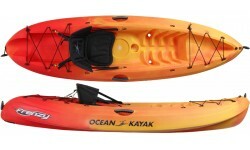 A compact angling kayak with all the renowned features & performance of the trident series. This lastest version of the Trident 13 packs even more features & perfect for the coastal fishing. At 4.1m in length it brings a perfect balance of pace & manoeuvrability whilst being easy to handle of the water. If you fish off the UK Coast then this is the boat for you! 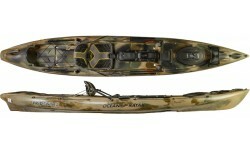 The Trident 15 is a fully feature angler kayak that offers the performance to handle big sea conditions for those looks to venture further offshore. Incorporating all the best storage and angling features the fisherman might need. 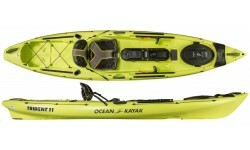 The Ocean Kayak Big Game II is all about stability and comfort. The ultimate solution for those looking for a platform to fish from for long periods with various rod holder mount options. 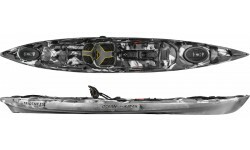 The Ocean Kayak Trident Ultra 4.3 is a high performance angling kayak designed for coastal fishing and packed with an array of innovative features for perfect fishing trip.